Shem Creek Inn. To make a reservation visit https://www.shemcreekinn.com/ or call 843-881-1000. The code to get the Mardi Crawl discount is MGC. Holiday Inn Express at 350 Johnny Dodds Blvd also has rooms blocked. Call 1-800-465-4329 and mention PHC to get the special rate. 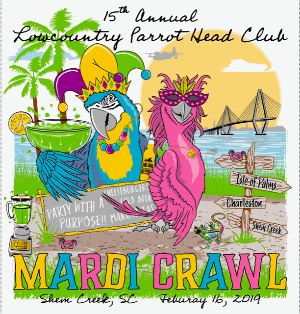 Extended Stay America also has rooms for Mardi Crawl participants for 2/15 and 2/16 at a rate of $119 per night (double occupancy).